Departing the El Monte Sagrado Resort by coach, we were taken to an encampment along a stretch of the Rio Grande River that was, were were told, a fraction of its previous flow. Cisco – whose name is Francisco Antonio Miguel Niño de Ortiz Cadron de Guevara – gave us a safety lecture pertaining to wearing personal flotation devices and what to expect during the river “float”. Cisco with one of our travelers. We then were taken to the embarkation point, placed 5 to a raft with an oarsman aft and a Native American Guide on the bow, and pushed out onto the water. Luckily it was a warm day, and there was no spray over the bow. We were treated to a description of Pueblo life as the oarsman negotiated the 3 or 4 inches depth of river flow. After an hour we arrived back to the encampment where a Native American lunch of buffalo stew, potatoes, freshly baked bread, and salad was prepared. Wife and Daughter of our Native American guide. Three children belonging to our guides. Our next stop was Ghost Ranch. This 21,000+ acre area is owned by the Presbyterian Church and functions now as a retreat and education center, and archeological study site. It is the place where the oldest dinosaur fossil has been found, estimated to have lived approximately 200 million years ago. This is an intact block taken from the base of a cliff on site. Some of the reconstructed fossils found at this site. Obsidian spear and arrow tips, common in this area, date back thousands of years. The large spear tip was made by the Clovis culture that existed 13,500 years ago. They hunted the ancient buffalo that is the precursor of the present buffalo. Towards the bottom the display are the oldest arrow points. and the subject of many of her paintings. The light gray strata in both foreground and background are said to be due to times with little to no rain, leaving the iron content unoxidized. One might wonder, however, why the exposed surface hasn’t become oxidized. With such a space in which to be creative, it is easy to understand why Georgia O’Keeffe preferred this to New York City. We awoke to 28 degree F and a thin covering of snow. Our original plan for the group photo was that it was to be taken in front of the Cathedral, but the venue was changed to the hotel entrance, under cover. The snow showers became rain and we “soldiered on” for a walking tour of the Santa Fe Plaza area, starting at the Cathedral Basilica of St. Francis of Assisi. This a statue of a Mohawk. One of the stops along the Plaza was this courtyard where, I believe, scientists were met and taken to Los Alimos during WWII. Across the street from the Plaza pavilion was a sheltered porch where many Native Americans were selling their handmade jewelry. This particular area is identified to be a tax free zone similar to a reservation. Charles Ortiz – I know, his name sounds Latino, but derives from early Mexican occupation of New Mexico – sold us a very nice silver bracelet with Native American symbols on both the inside and outside. He then wrote a description for each symbol. We then were met by long time friends from our days in Philadelphia, Dr and Mrs. Sussman. Jim has located to New Mexico practicing Internal Medicine and Allergy, while Susan works with a high security clearance at Los Alamos. We were treated to lunch and were taken to their beautiful adobe style home just out of town. This morning, we visited the museum and atelier of two distinctive artists, Georgia O’Keeffe, and Somers Randolph. 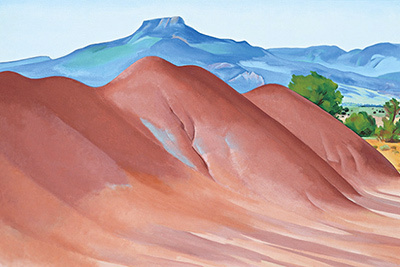 The following are original paintings by O’Keeffe of some of the scenes I took at Ghost Ranch, shown above. Just a short coach ride from the O’Keeffe Museum brought us to the atelier of Somers Randolph, a Princeton graduate who has studied sculpture at Corcoran School of Art in Washington DC, and apprentised in Pietrasanta, Italy, has earned the title of Master Craftsman over 3 decades of carving stone, hand picked from locations world-wide. Somers is an affable engaging gentleman whose home reflects his many interests and perceptions. I’ll include a few pictures I took and one taken from his promotional material. The following is from Somer’s promotional material: a picture of a picture. This evening, we gathered for our final meal together before setting off to the airport in Albuquerque and the flights home.